A right-holding dataset has been built concerning the E&P companies with an interest in the Guyana-Suriname Basin in order to shed light on the competitive landscape therein. Country-by-country snapshots of the dataset are presented here, showing which companies are present where and how much net acreage they held in the basin. The right-holders in the basin are compared in terms of net acreage in the basin. Previously, I discussed the emergence of the Guyana-Suriname Basin as the hottest offshore petroleum province (see here). The discovery of giant oil fields by Exxon Mobil (XOM) and partners Hess (HES) and Nexen (CEO) is followed by an oil rush in the basin, with dozens of E&P companies scrambling to establish a position there. In this article, let's take a closer look at the competitive landscape in the basin to understand which companies are present in the basin with a working interest and how much acreage each of them holds, such that we can lay a foundation for future discussions on which stocks we as security investors can pick so as to profit from the rise of this frontier. 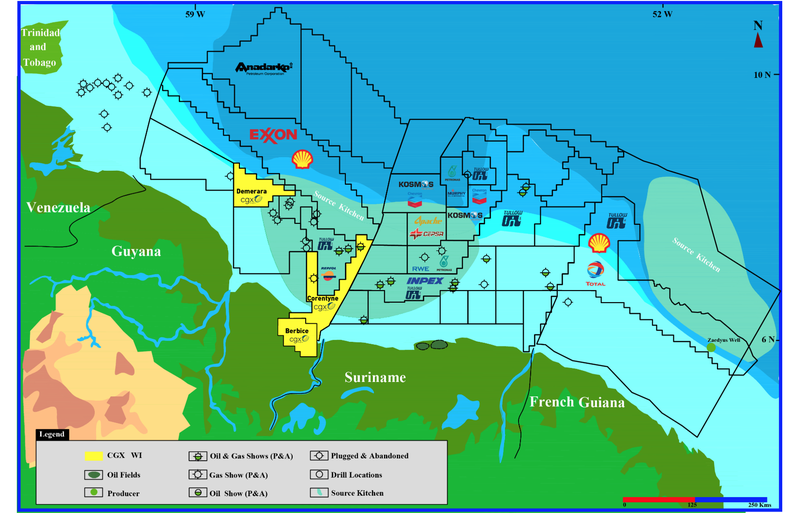 A dataset of all E&P companies with a working interest in any contract blocks in offshore Guyana, Suriname, and French Guiana has been compiled to build a whole picture of the right-holding situation in that part of the world. The dataset, complete with detailed information as to the operatorship, working interest partition, acreage, and data source, and to be updated regularly, can be downloaded by TNRH members. Below are a few snapshots extracted from the dataset. There are a total of 14 E&P companies holding 8 offshore and one transitional zone blocks (i.e., the Berbice Block of CGX Energy (OTCPK:CGXEF))(Table 1; Fig. 1). Fig. 1. A map showing offshore contract blocks in the Guyana-Suriname Basin, the serial numbers of which are as shown in Table 1 and 2. Source. Table 1. A list of companies with assets in offshore Guyana. Note *, CGX owns 62% of ON Energy, which wholly owns the Berbice Block. Local private company Mid-Atlantic Oil & Gas Inc., and Eco Atlantic Oil & Gas Ltd. (OTC:ECAOF). 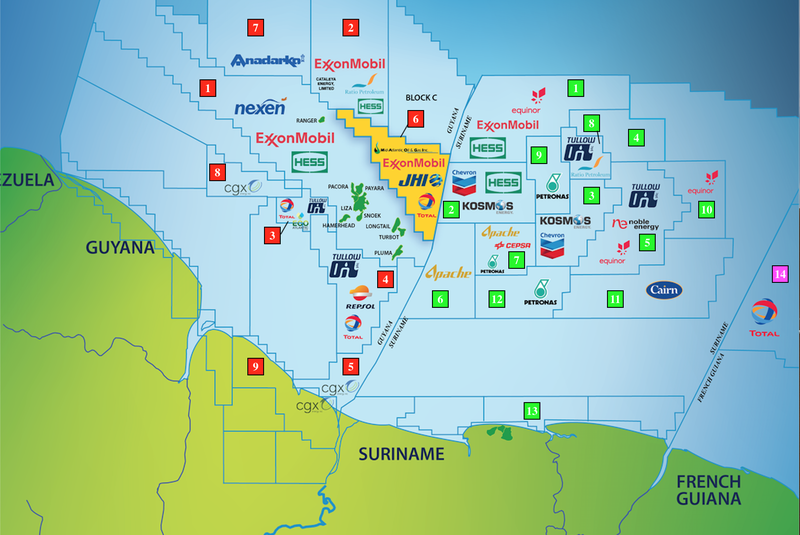 The blocks surrounding Exxon Mobil's 12 discoveries, e.g., Orinduik, Kanuku, Corentyne, and Canje on the Guyanese side and Block 42, 45, 48, 53, 58, 59, and 42 on the Suriname side, have drawn an incredible amount of interest. Table 2. 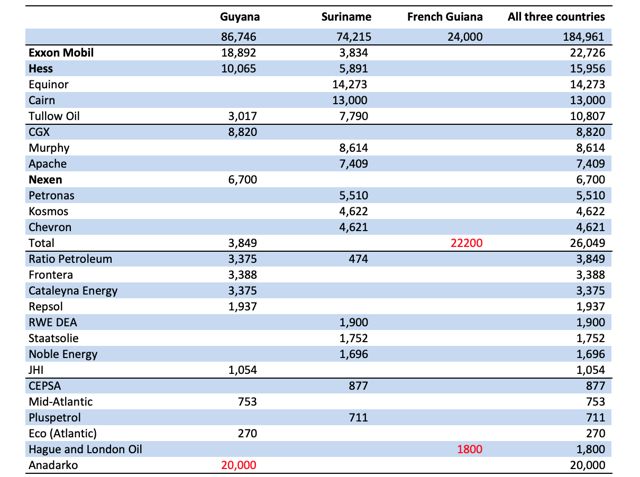 A list of companies with assets in offshore Suriname and French Guiana. Fig. 2. The right-holding situation in the Guyana-Suriname Basin, in relation to the source kitchens. Source. Now that major breakthroughs had been made over the western half of the source kitchen of the Guyana-Suriname Basin, the expectation is high that a similar extent of success can be attained over the eastern half on the Suriname side (Fig. 2). At least the play types on the Suriname side are similar to those reported on the Guyana side, according to Staatsolie (Fig. 3). Fig. 3. Maps showing offshore plays (left) and blocks (right) in Suriname. Sources: Here and here. Total reportedly applied for an extension so that it can hold on to the Guyane Maritime License (see here and here), after Shell (RDS.A, RDS.B) (45%) and Tullow (27.5%) had exited following the disappointing appraisal results of the Zaedyus discovery (see here and here)(Fig. 4). Hague and London Oil said it had acquired the interest of Northern Petroleum and obtained a 7.5% interest (see here). Fig. 4. 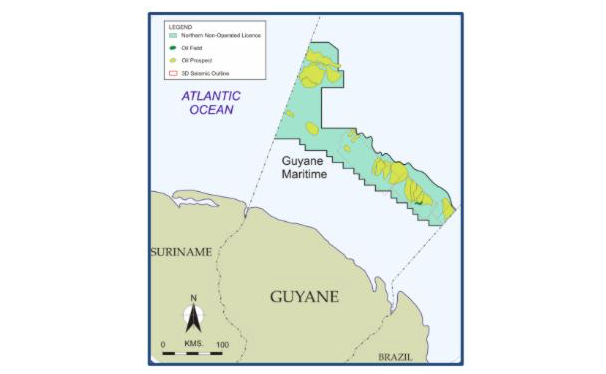 The Guyane Maritime License off French Guiana, shown with prospects and the Zaedyus discovery. Source. Table 3. The net area positions (in square kilometers) of E&P companies in the Guyana-Suriname Basin. The author's calculation based on data compiled from press releases and financial reports of various companies. Whether an oil discovery in the basin can move the needle for the investors. Sign up today at The Natural Resources Hub and benefit from Laurentian Research's in-depth research right away!